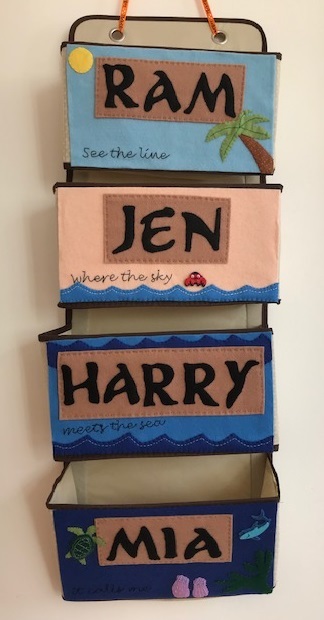 Jennifer's Little World blog - Parenting, craft and travel: 2016 unfinished craft projects - an update! Way back in December last year I wrote a blog post with a list of my unfinished craft projects, and the intention of ticking a few of them off throughout the year. As this year draws to a close I thought I'd post a little update to see how I got on! Sky Blanket - This was my daily craft project for 2016, and I finished it pretty much on schedule! 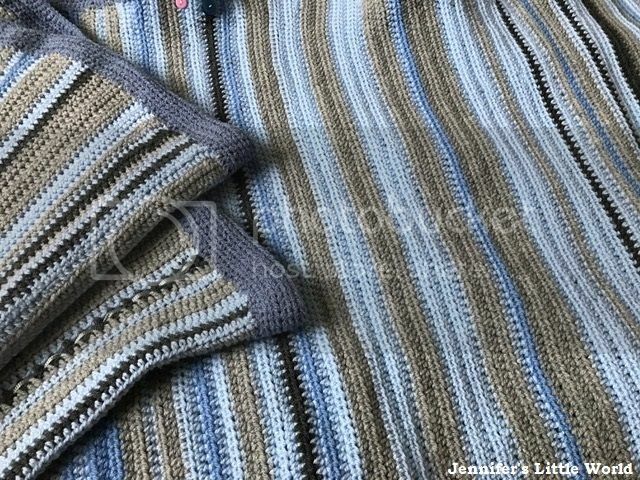 You can read all about it here - My completed crochet Sky Blanket. The daily rows were finished at the end of the year, then it took me a few weeks to finish it off with the border. It really is a massive blanket and has proven to be very snuggly this winter. 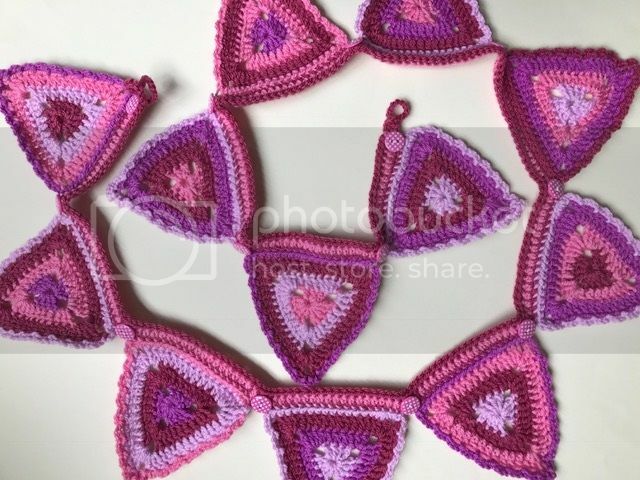 Crochet Pink Bunting - I received this Attic 24 bunting kit for Christmas a couple of years ago but it had sat on my to do list for far too long. In the end it was a very quick project to finish, and you can read all about it here - My Attic 24 summer bunting. It is hanging up above Mia's bed and she loves it. The leftover yarn from the bunting led on to another bonus project - a pink granny square blanket which I crocheted for Mia. I alternated rows of the pinks with some white yarn that was left over from the Sky Blanket. It worked up really quickly into a lovely blanket that she keeps on her bed and which matches the bunting nicely. Hexagon knitted blanket - this was a blanket that I started when I really wanted to learn to crochet but just couldn't get the hang of it. Now that I can at least do simple crochet I'm realistically not going to get to finishing this blanket, also I used up all the yarn I'd put aside for it in my other granny square blanket. So I have about thirty small knitted hexagons and I'm trying to think of a way that I can use them, perhaps for a cushion cover or bag. 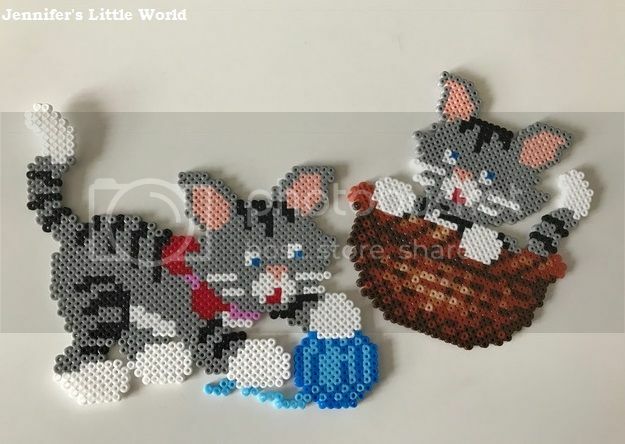 Mini Hama bead cats - I love working with mini Hama beads, and I was given a lovely kit to make two sweet little kittens. I finally got on and finished it and I love the finished pieces! Poppy mosaic kit - This is a matching kit to my sunflower mosaic kit and had been sitting around for ages. And I actually finished it a couple of months back! But unfortunately the mortar that I used all went a bit crumbly and I was too scared to remove it from the mould, instead it is sitting in the garage 'setting'. At some point I need to be brave and go and see how it's getting on and whether it can be rescued! Wooden box and Ladybird pictures - Still not got to this one, the idea was to use some pictures from a falling apart Ladybird book to decorate a wooden box. I've filled up the box but it remains picture free! Ikea frame - I picked up a Ribba box frame on a trip to Ikea and I have several ideas, perhaps using it to hold tickets and mementoes, something like this keepsake box. Or else filling it with seashells and sea glass. It's currently sitting on the shelf above my desk, empty and mocking me! I think I've done pretty well! As well as ticking quite a few things off I also managed a whole bonus blanket! There are still a few things to carry over to next year and I have plenty more ideas to add to the list, so look out for a post shortly with some of my crafty plans for 2018! naw, thank you Jennifer, my memories box is full, we do have all sorts in there and not just tickets mind. I'm hoping to create a new one for 2018. Good luck in getting some of your projects ticked off in 2018.